This London trip had been planned for months, and for most of those months I’d intended on visiting Meat Liquor (visited the following year, see here) for it’s epic burgers. However, a few weeks ago I heard about Burger & Lobster which has a similar reputation for its burgers as well as the added bonus of selling the best value lobster in London. So I spent the next few weeks debating where to go. 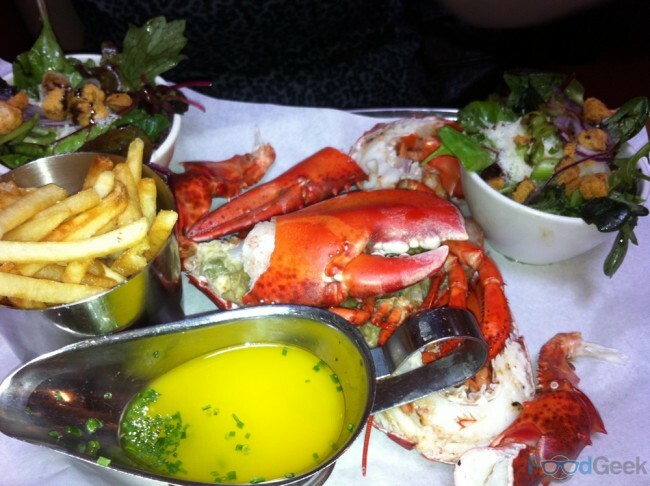 In the end Burger & Lobster won, mainly thanks to my love of lobster. 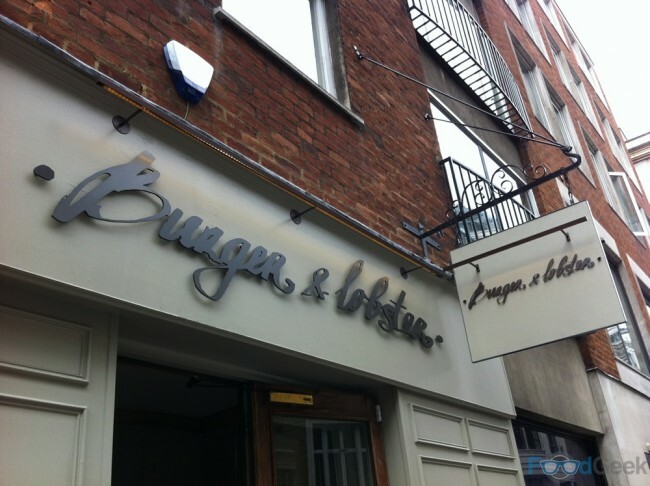 The first thing you need to know about Burger & Lobster is that like Meat Liquor and several other trendy restaurants lately it is ‘no reservations’. I’ve read several reviews of huge queues so wasn’t looking forward to a long wait. Although it was busy when we arrived they weren’t completely full and there was just about room for us. It was around 2pm so we probably just missed the lunch time rush. I’m certainly not a fan of queuing but I can’t help being slightly disappointed that I didn’t need to. Weird I know. It’s much bigger inside than it looks from the outside, we were taken past the bar and seated towards the back of the restaurant. It was busy and noisy but I liked the place already. 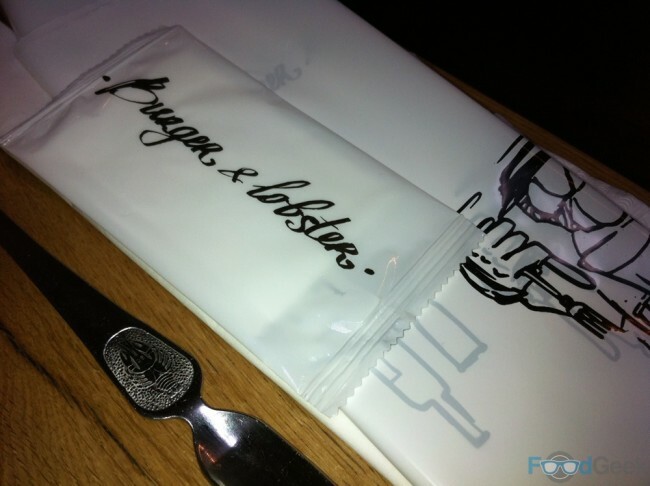 There are no menus at Burger & Lobster, they don’t need them. There are no starters. Main courses consist of, you guessed it, burger & lobster. Actually there is a bit more too it than that. For the burger the only decision is whether to have cheese & bacon but the lobster comes either as a lobster roll or a whole lobster. The lobster roll has no other options but the whole lobster can be either steamed or grilled and served with butter or garlic butter. To keep things simple all 3 menu options cost £20. Pricey for a burger but fantastic value for a 1.4lb lobster. Choosing what to order was ridiculously difficult considering we were basically choosing 2 out of 3. Since we were here instead of MeatLiquor surely we needed to try the burger? I love a whole lobster and hadn’t had one for a while so that seemed obvious too but the lobster roll looked and sounded so damn good. In the end we had to order all 3, if we hadn’t i’m pretty sure I’d still be sat there now trying to decide. So I ordered my burger, with bacon & cheese of course. They won’t cook them rare which was disappointing so I ordered medium-rare. The lobster, steamed with garlic butter. 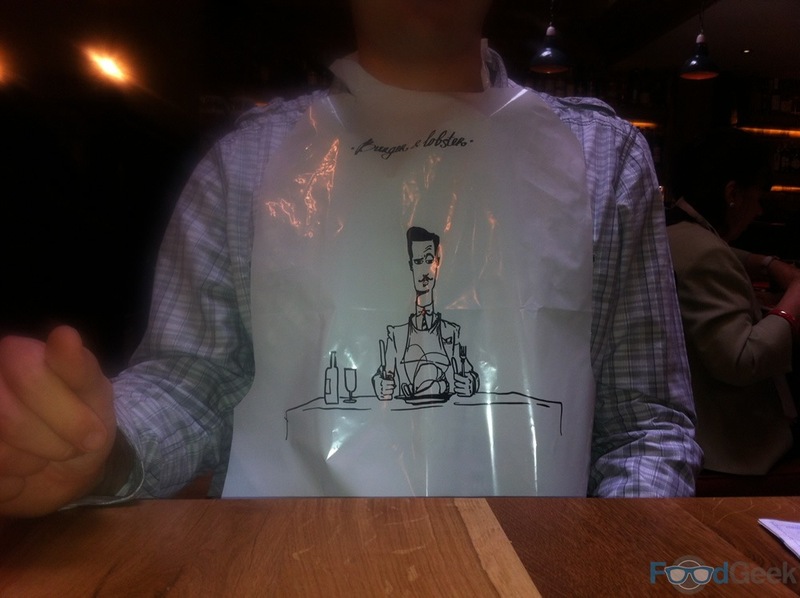 Before the food arrived we were given the usual knifes, forks, napkins and…. a bib! I put mine on straight away and thought I looked pretty great. The food arrived shortly and I was worried whether we’d mange to eat it all, considering it wouldn’t even fit on the table. All menu options come with fries & a salad so as well as a huge burger, lobster roll & whole lobster we had three portions of fries and three salads. The burger was pretty good, despite being slightly overcooked for my liking, although it was still a little pink and quite juicy. The bacon was incredible and the brioche bun great too, the pickles, lettuce tomatoes and cheese all in all made for a great burger. The lobster roll was delicious too, it looked quite small initially and I was questioning whether it was worth £20 but it was deceiving, there’s a LOT of lobster in that roll. It was also very rich thanks to the mayonnaise which had a hint of wasabi (I think). Finished with a sprinkling of chopped chives, simple but delicious. The whole lobster was cooked perfectly and I still can’t quite believe that it only costs £20 with the 2 sides as well but I suppose the burger buyers are subsidising it (thanks!). The garlic butter was gorgeous and I had to restrain myself not to drink from the pot. There are few better things in this world than a mouthful of perfectly cooked, juicy lobster that’s been dunked in garlic butter as good as this. My only complaint with this dish it that they don’t provide any crackers to help break the lobster, only a lobster fork which is fine for getting meat out once you’ve broken the shell but not very helpful for getting started. I managed OK but Mrs FG (obviously not as strong as me) struggled with the claws and needed help (+10 man points). The salad was tasty, certainly not a salad for dieters though with huge amount of parmesan, croutons and dressing but this probably isn’t the place to be if you’re on a diet. The fries were cold the first time unfortunately but when I told the waiter he seemed genuinely concerned, apologised several times and had them changed immediately. The replacements were hot, crunchy and well seasoned. Again simple, but good fries. We managed to finish everything except a few of the 3rd portion of fries and salad which was pretty impressive if you ask me. It also left no room whatsoever for dessert but that’s OK because they only serve chocolate & lime mousse which I’m sure are great but not something I got too upset about missing. We had a couple of Mojito’s from the bar which were very good, there’s an extensive selection of cocktails which like the food all cost the same at £9 each. 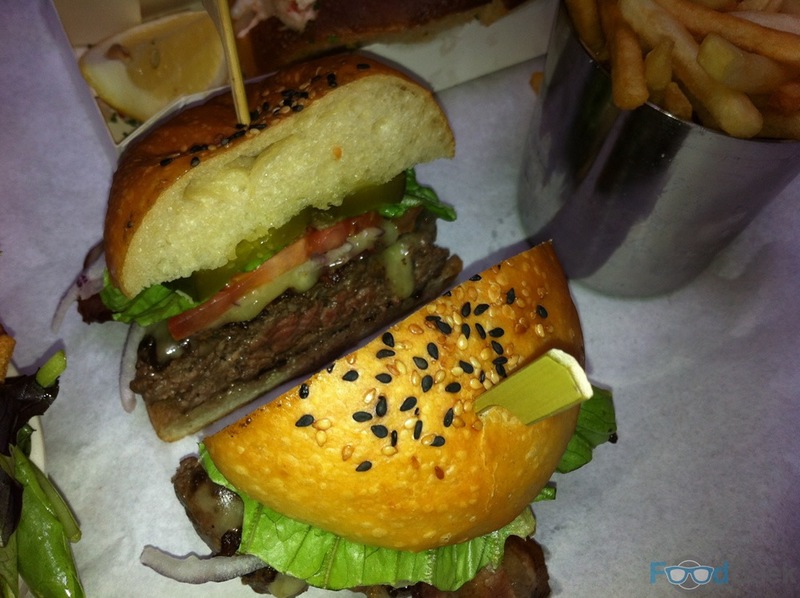 I loved Burger & Lobster. If I lived locally I’d be there all the time, it’s top quality ‘fast food’ and good value too. 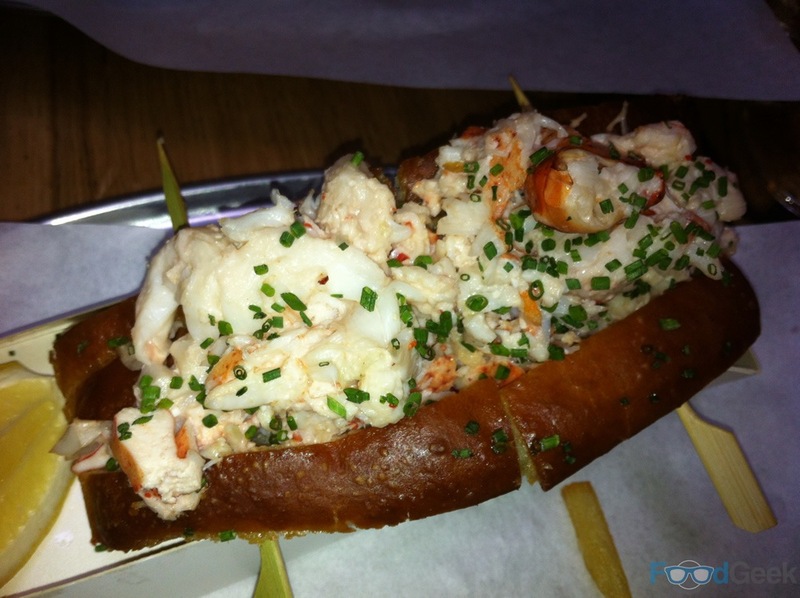 Summary : Pricey but good burgers, excellent and great value lobster. This is proper 'fast food'.